The ZOMBIE wants to rip your arms off… the ZOMBIE wants to tear open your skull-bucket and devour your brains… It’s all about the Zombie… ZOMBIE, ZOMBIE, ZOMBIE!!! To hell with your important business meeting… or your long-awaited vacation… to hell with your lunch date with grandma… to hell with your stupid wedding reception… GAH! See what I mean??? SO friggin selfish! What a bunch of JERKS…!!! Come here so I can eat you! 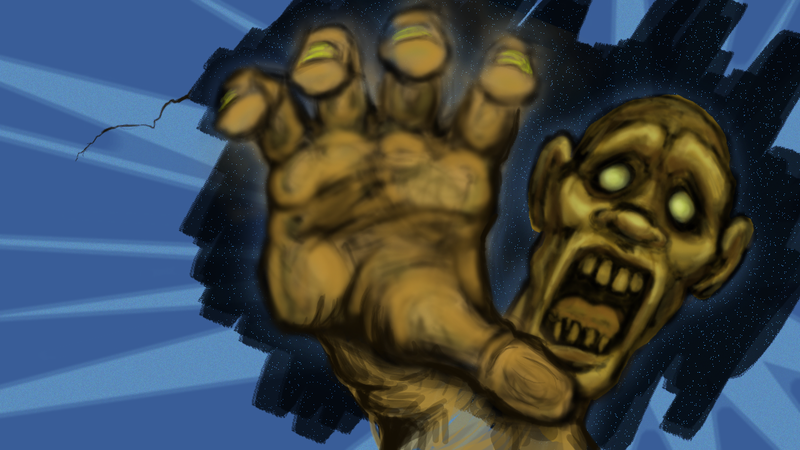 I think this may be my favorite of all my Zombie sketches so far. It captures the look and the style I was after throughout this exercise. I’m really satisfied with this one. At least for a while… I’ve got some other doodles that I want to give a little time to. But you know Zombies… you can’t ever really get rid of ’em… not really. This entry was posted on August 26, 2009 by Sean Gallo. It was filed under drawing, illustration, zombie and was tagged with art, artist, character design, chief crunchy, chiefcrunchy, concept art, digital art, drawing, fast moving zombie, living-dead, photoshop drawing, photoshop painting, Sean Gallo, seangallo, seangallo_designs, sketch, undead, walking dead, Zombie.